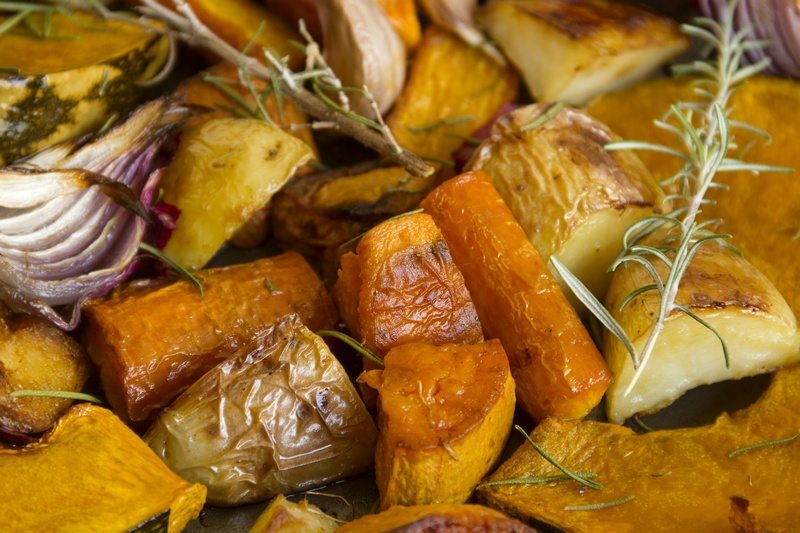 Rustic Roasted Vegetables | Food, glorious food! A simple, easy to prepare and cook complete meal or use to accompany any roast or grilled meat dish. Strip most of the rosemary leaves off the stems. Set stems aside. Place all vegetables, herbs, oil and seasoning into a bowl and combine with your hands so that everything is lightly coated with the oil and the vegetable stock powder. Put vegetables on your tray/s, add remaining rosemary stems and roast for approximately 40 minutes or when the potatoes are tender. To make this a complete meal, try adding 250 grams of sliced Portabella mushrooms and 150 grams of walnuts. Note that the walnuts are roasted separately for the last five minutes and then tossed through the vegetables. Delicious and nutritious! 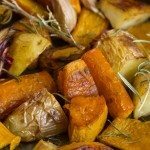 Hi, this is so helpful that you share the nutritional facts for each recipe, especially for dieters!